Imagine preparing perfectly cooked rice in less than 15 minutes! This versatile side dish will take your weeknight meals to a whole new level. Basmati rice is prized for its light nutty flavor and sweet aroma. In this recipe, basmati rice is prepared in a MultiPot pressure cooker and elegantly seasoned with lemon and black pepper. Both lemon juice and lemon zest are incorporated into this dish for incredibly flavorful results. The zest is added into the pressure cooker along with the rice, water and butter. The lemon juice is added just before serving for a bright burst of flavor. The result is a sophisticated side dish for your favorite meat or fish dishes. Stir water, rinsed rice, butter, and lemon zest together in your pressure cooker. Select Pressure Cook (Manual) and cook for 3 minutes on Low pressure. Sprinkle lemon juice, salt, and pepper over the rice and gently fluff with a fork. Basmati is a flavorful long-grain rice, traditionally from the Indian subcontinent. This aromatic rice means "fragrant" in Hindi. It is often eaten in pilafs and biryanis or as an accompaniment to curries. Per Serving: 86 calories; 2g fat; 15.1g carbohydrates; 1g protein; 5mg cholesterol; 182mg sodium. Maybe not for the rice purists, but when you get over that, adding some flavor to rice really feels like upping your game. I pair this with grilled chicken with a citrus-y marinade. They work terrifically together. Haven't had leftovers yet to try in a stir-fry the next day, but I bet it'd also make a great addition to that Greek lemon-rice soup thing! Tried this out yesterday. Makes some great fluffy rice. I skipped the lemon and the pepper and paired it with a stew. This lemon-pepper rice was amazing! A little spicy and a little zesty. It makes an amazing side dish and is so flavorful, it would be great for holidays or other special occasions too. I served it up as a side to my fish tacos and loved it. I really enjoyed this recipe and it paired great with my salmon filet. This is a good example of how jazzing up simple rice can make a huge difference. Very good. 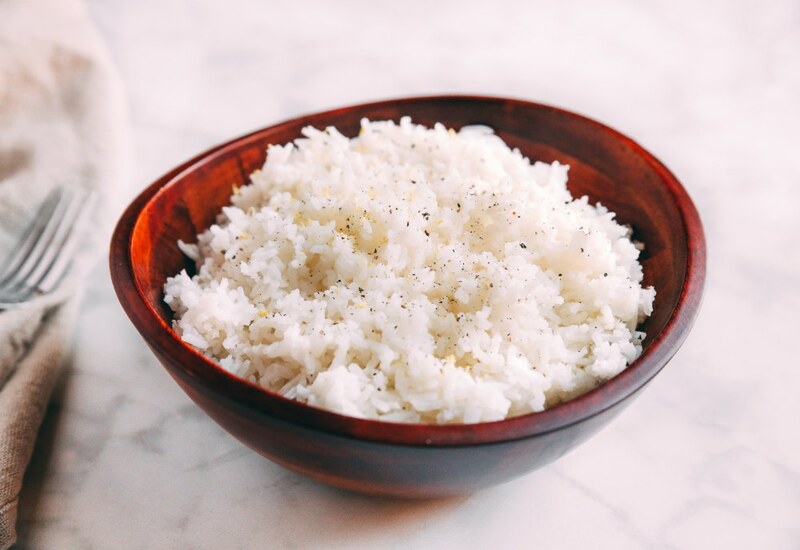 I use this recipe all the time as a base to make plain white rice in my pressure cooker. Works every time! Came out great. Might add a bit more zest next time. I had quit cooking rice as I couldn’t get it right. I took off the Mealthy top and my husband said...oh that looks like good rice. It was soft, fluffy and PERFECTLY cooked!! With just two of us I cut rice to one cup and water to one and a quarter cup. Timing stayed the same. Soooooo happy!!!! Absolutely fantastic as written! Never tried this version of basmati, but it’s my new favorite! Paired with butter chicken, prepare for food coma. This recipe is perfect! You can season it with anything you want. I made mine seasoned with chili lime seasoning. The only thing I suggest it to use some veg oil as it would give it a nicer taste.